Levi had an appointment at the CF center today – just a regular check-in. It was a bit of a different day, though, because it was his last appointment with Dr. Spoon. Dr. Spoonhower is leaving our clinic for another one close by. We will see another wonderful pulmonologist (Hi Dr. Strawbridge! ), but we will really miss Dr. Spoon. 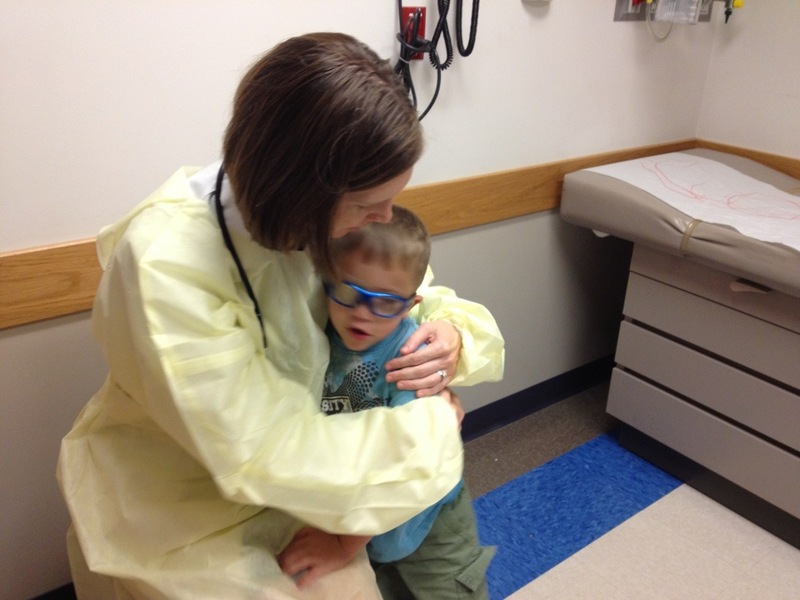 Levi – who has far less resentment about doctors and nurses and pokes than can reasonably be expected from a kid in his situation – has greeted her with a mega-decibal “DR. SPOON!!! !” almost every time she’s opened the door since he’s been able to talk. He adores her. She was the first doctor we saw when we went to clinic for the first time with our three-week-old baby, mostly terrified about what we were going to hear. Instead of a lot of medical jargon, we got an explanation of cystic fibrosis that included the phrase “like a fat guy in a mosh pit” (explaining why the thick mucus that CF patients get is a problem for the cilia in the lungs). I still use that one when I’m explaining CF to people for the first time, and it makes them laugh every time. She’s the doctor that Levi has seen most consistently and often in his short life, and one of the major reasons that he assumes all doctors are women unless otherwise informed. Which I think is pretty cool. We missed Dr. Spoon terribly when she left us for a short time to have a baby (I know. Can you believe the nerve of some people? ), and when she returned my opinion of her bumped up another notch – she told me a story about her newborn getting sick, and how she wasn’t sure exactly what to do. Even though she’s a pediatrician. And it made me feel (even more) like I could ask her questions without feeling stupid. Levi’s checkup was a really good one. He’s gained weight and his lungs are clear, and he’s full of beans. I think it was kind of great that our last appointment with Dr. Spoon was such a good one – she’s taken such good care of him. I know we’ll have ups and downs in the future, but it was nice to send her off on a high note, I think. So we got hugs today (me, too, but I’m not as cute in pictures) and said goodbye. We will miss you, Dr. Spoon! Thanks for taking such good care of us, and thanks for leaving us in good hands. We know Dr. Strawbridge is awesome and we promise not to make her feel bad because she isn’t you. Good luck, and congratulations! And see you around.